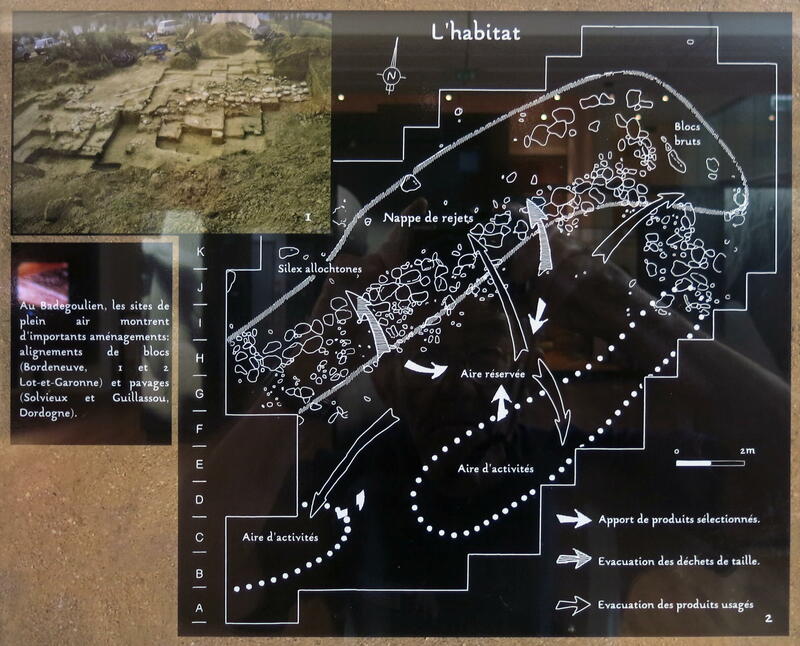 Grotte de Badegoule - a site which spans the Solutrean and the start of the Magdalenian. 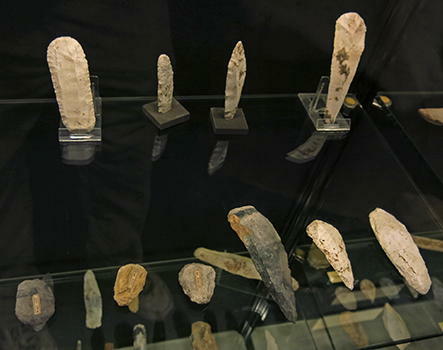 The Badegoulian culture spans the Solutrean and the early Magdalenian, and has been dated to between 19 000 and 17 000 BP. 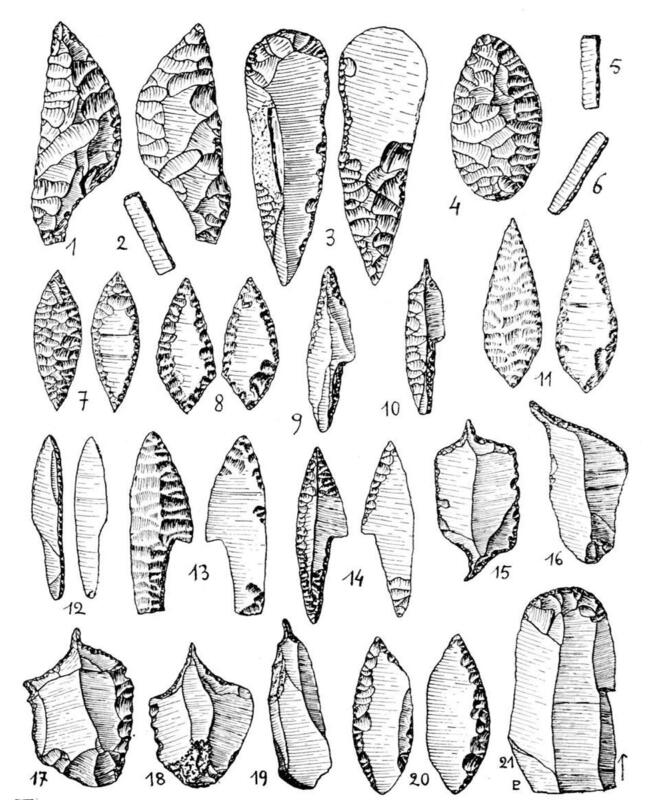 The lithic industry includes laurel leaf points and shouldered points, as well as the small scrapers known as raclettes. 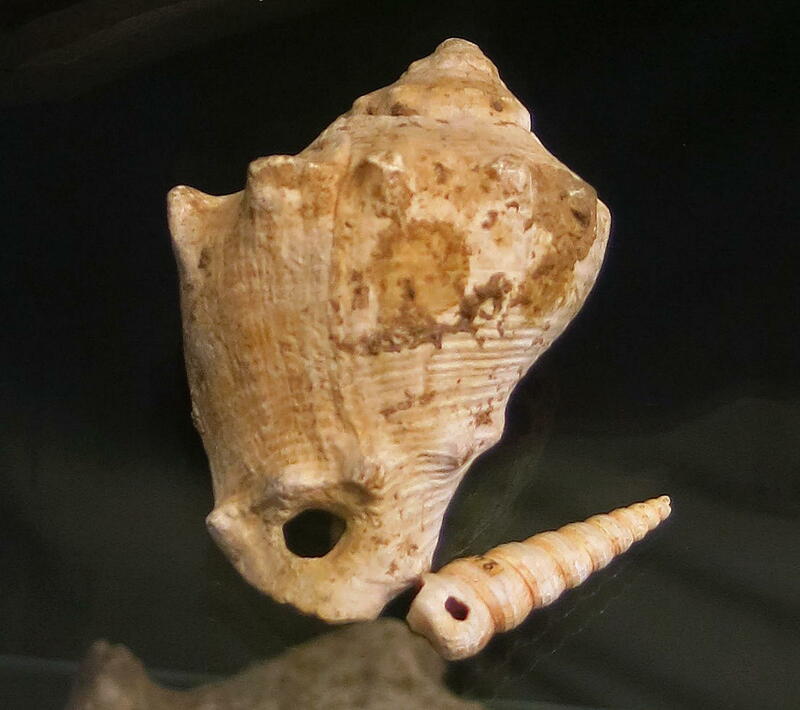 Shells for jewellery were obtained from fossil sites, as well as from both Atlantic and Mediterranean beaches. 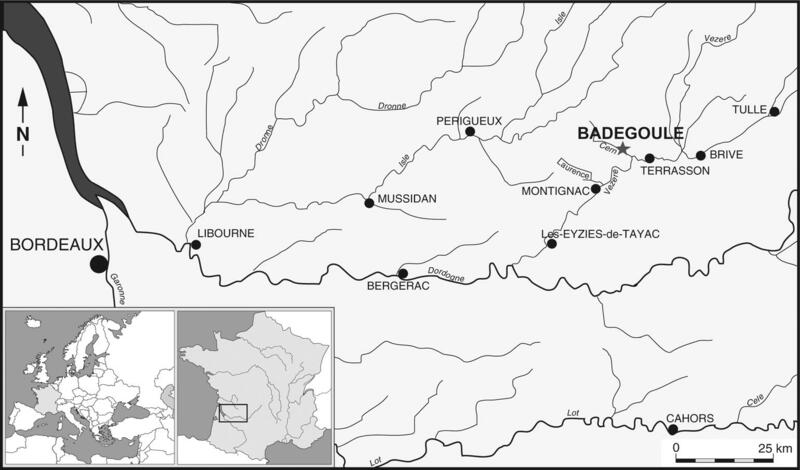 The site of Badegoule (45°08' N, 1°12' E) is in the Lardin-Saint-Lazare commune at the base and the extremity of a limestone cliff facing south, on the left bank of a tributary of Le Cern brook. 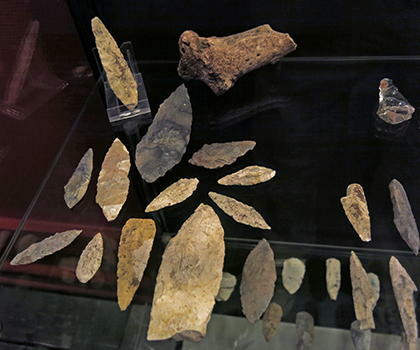 The site may have been a huge living place, covering a large surface on the slope of the present relief, at least 50 m long and 20 m deep. 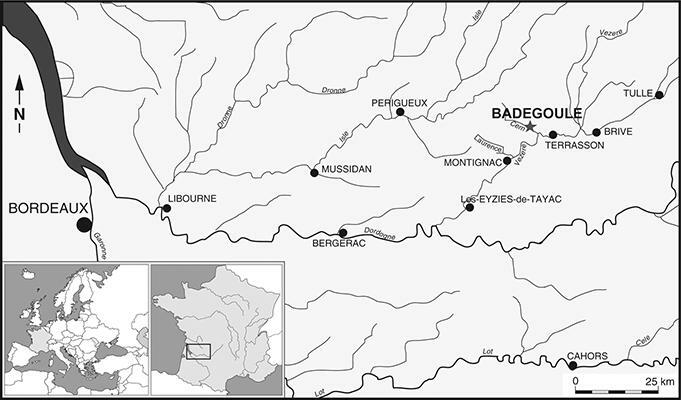 Location of the Badegoule site, Lardin-Saint-Lazare commune, Dordogne . 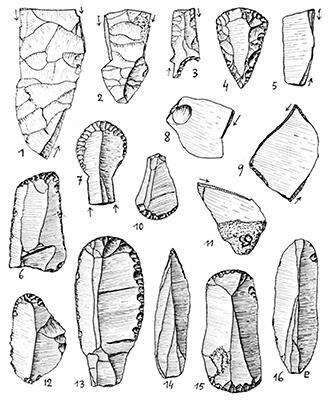 80 and 81: Perçoirs multiples, tools with multiple drill points fashioned on them. 82 to 86: Raclette (see below). 87: spear point with a groove. 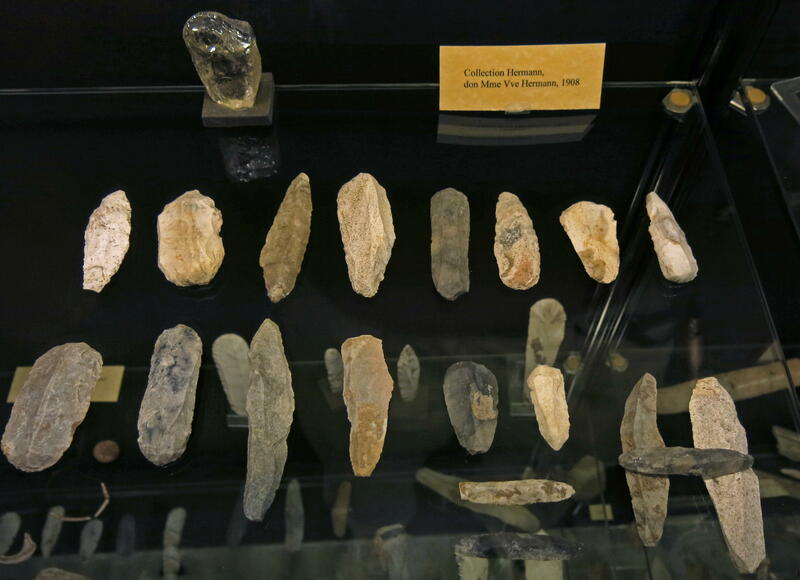 A raclette is a small flint flake, from 20 mm to 30 mm in diameter, and from 4 mm to 5 mm in thickness. One side is almost flat, usually with a clear bulb of percussion. The retouch may be on one side, two sides, three sides, but more usually all the way round. 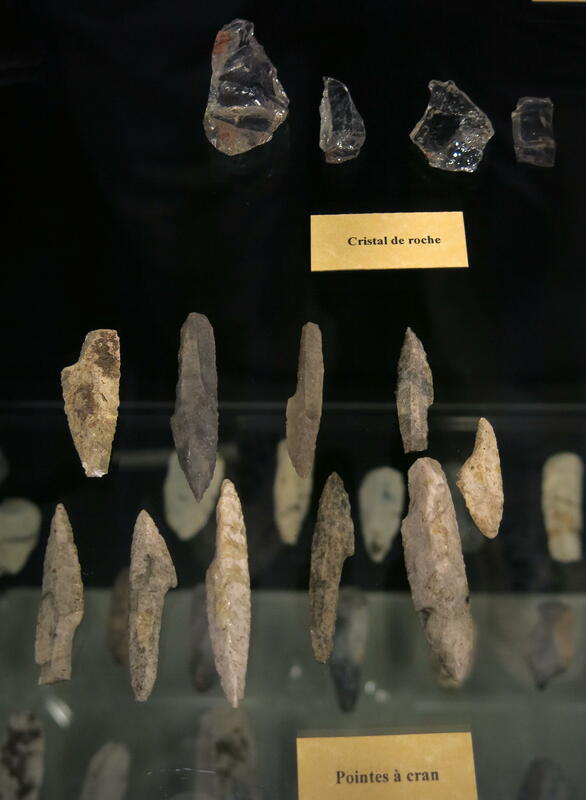 The name raclette was given to them by Cheynier (1930). Their main purpose was to scrape wooden baguettes to shape, for smoothing wood, and for the removal of bark. 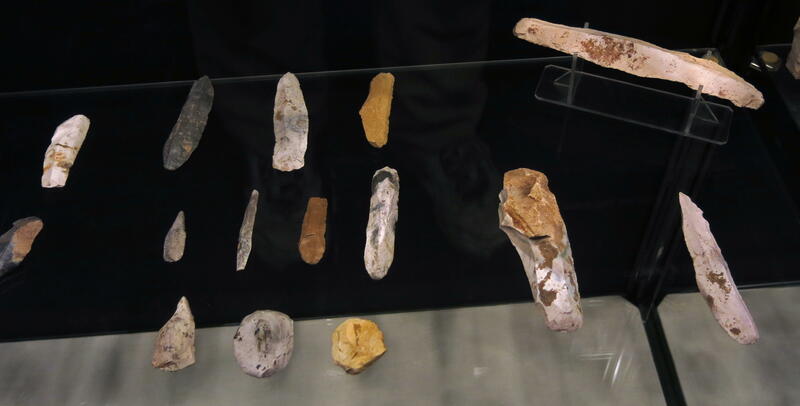 They are only seen in the early Magdalenian. Three leftmost tools: Leaf point. 98 to 101: Backed blade. Second left: Spear point with a simple (not forked) base. 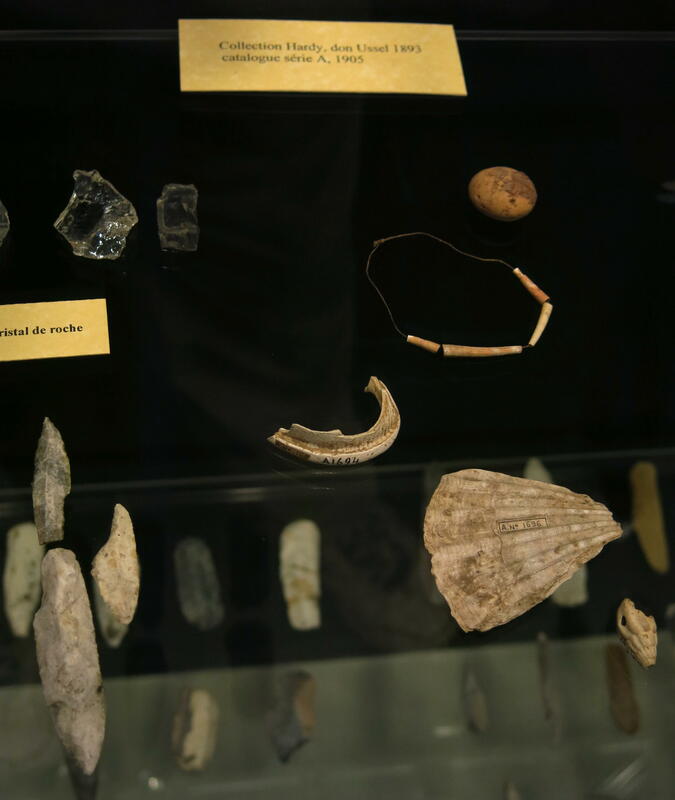 Next four: pendants of teeth and shell. 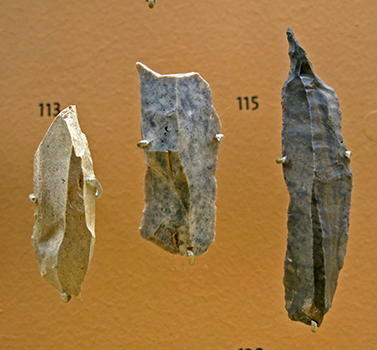 Left three: Laurel leaf points. 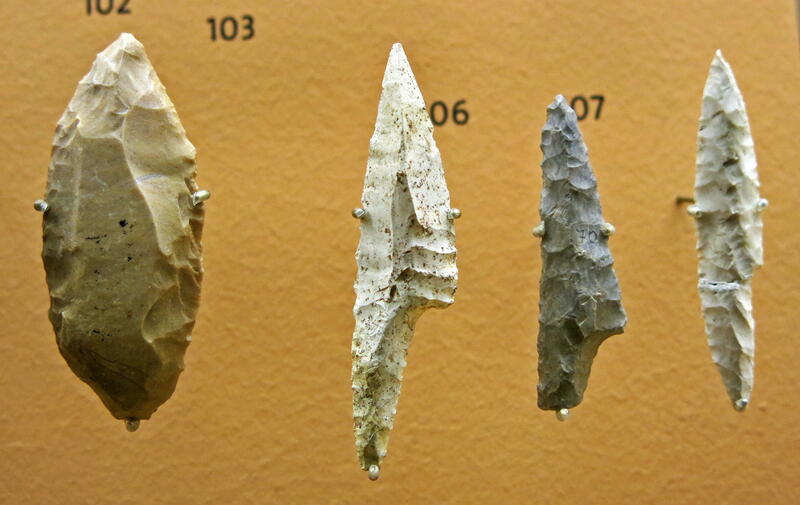 Far right: Flat faced point. Right three: Pointe à cran, shouldered point. 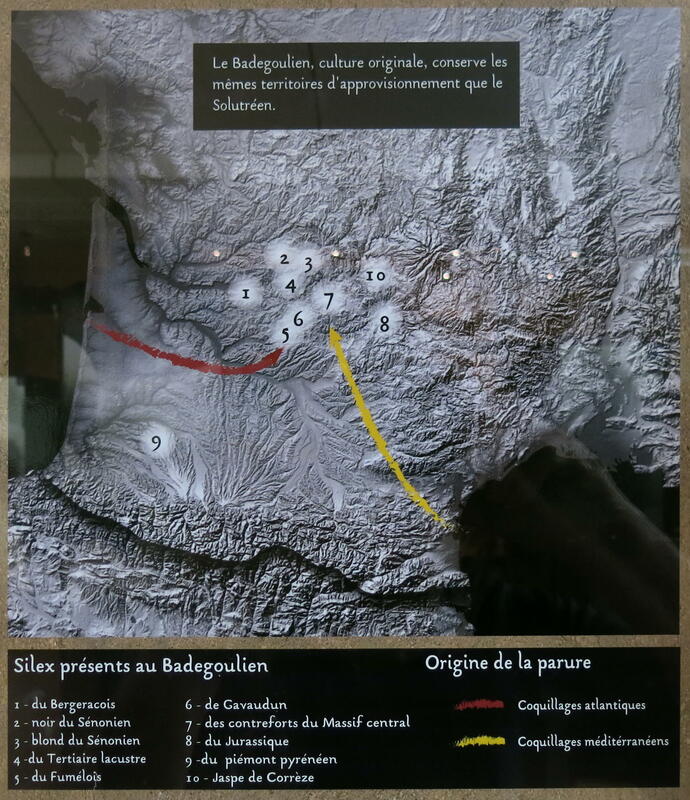 The Badegoulian culture occupied the same geographical area as the Solutrean culture. 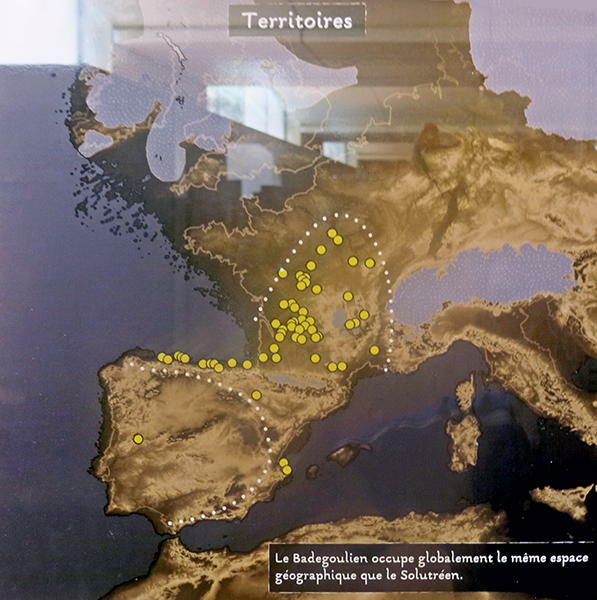 The particularly rigorous climate during the Badegoulian brought desertification to zones of higher altitude, and the lower plains saw the development of sparse vegetation. 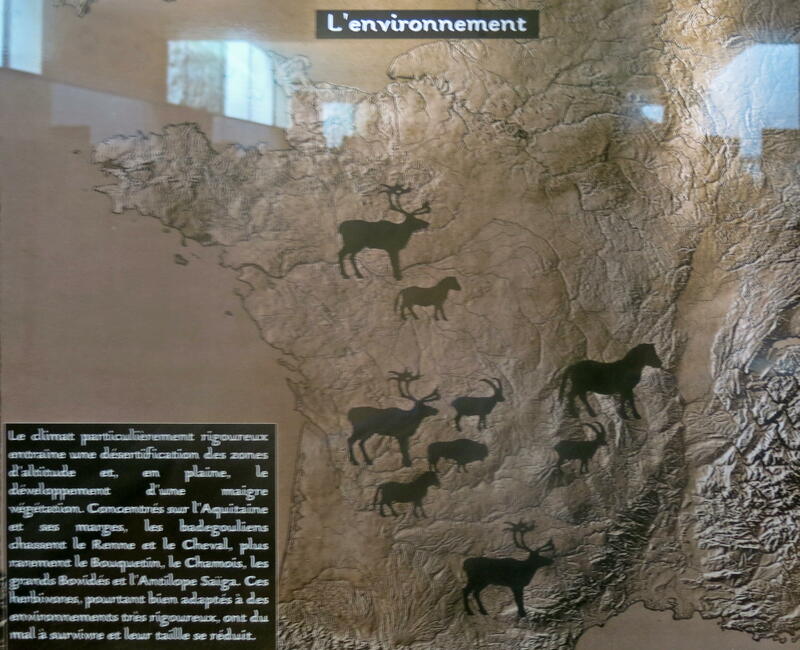 Concentrated on the Aquitaine and its margins in south west France, the Badegoulians hunted reindeer and horses, and, more rarely, ibex, chamois, aurochs, bison, and the saïga antelope. These herbivores, however well adapted they were to these very harsh environments, struggled to survive, and their size was reduced accordingly. Origin of Badegoulian flint and shells. 1. 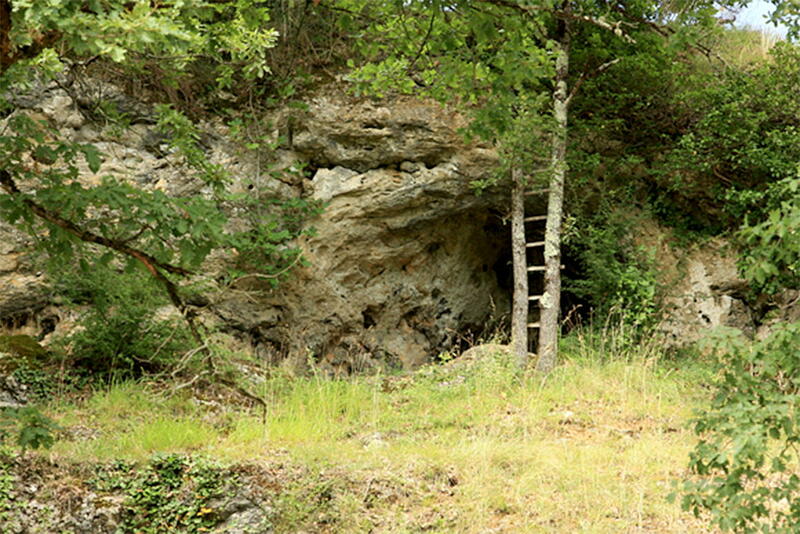 Magdalenian; La Roche, Lalinde, Dordogne. Length 180mm. 4. Solutrean; Badegoule , Dordogne. Length 190mm. 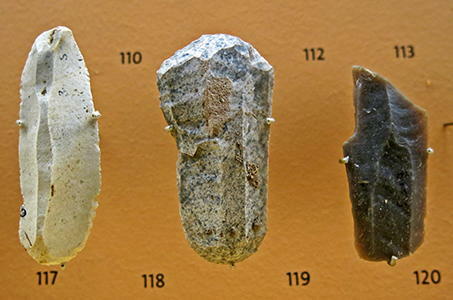 This tool is hard to categorise - it has features of a point, a burin and a scraper. 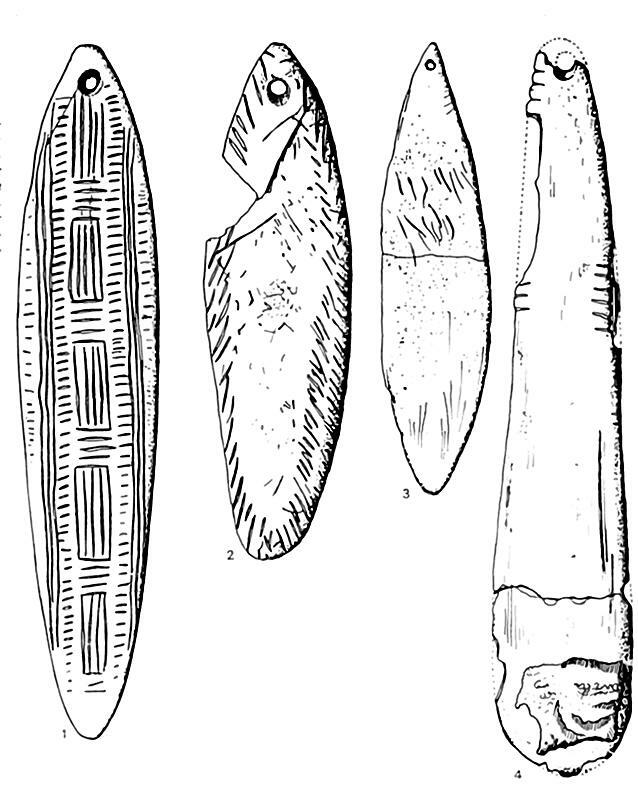 Badegoule shouldered points, (pointes à cran) and laurel leafed points. 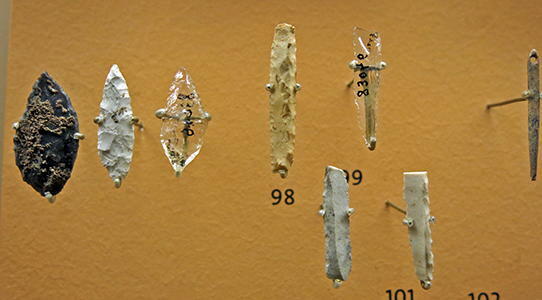 Badegoule scrapers and blades, with a rock crystal piece at the back. 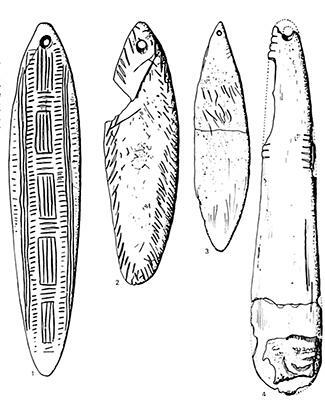 Laurel leaf blades, with some shouldered points on the right of the image. 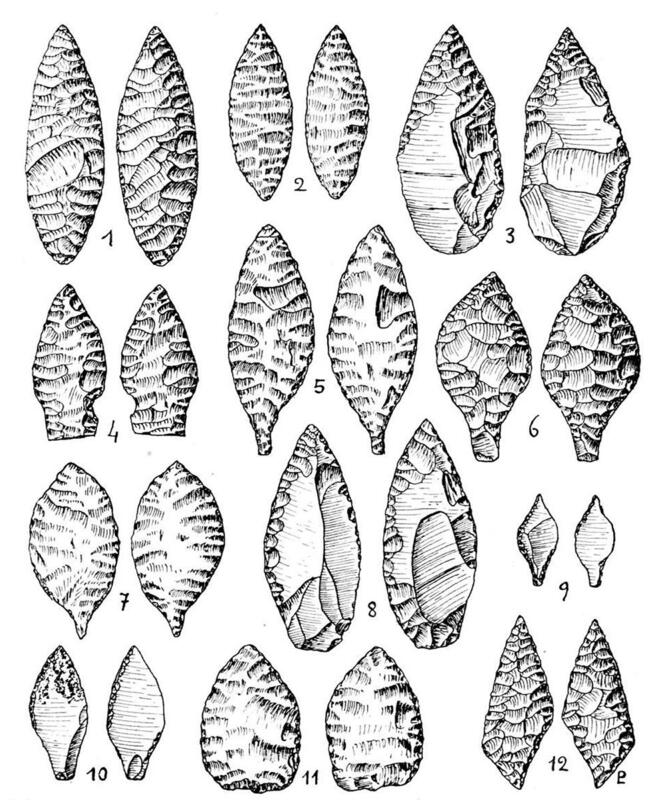 Laurel leaf blades: 1 to 8, 11 and 12. Fléchettes : 9 and 10. 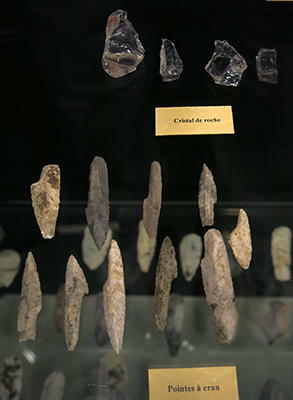 Pointes à cran (shouldered points), and some rock crystal pieces. 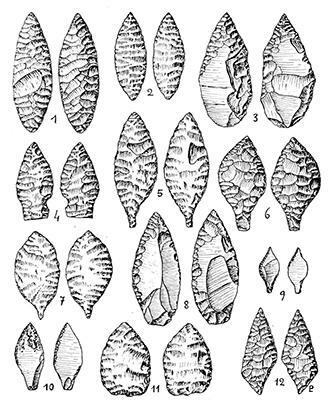 Laurel leaf blades: 1, 4, 7, 8, 11, 20. Shouldered points: 9, 13, 14. Drills : 10, 15 to 19. 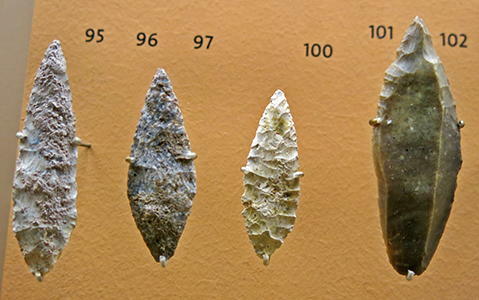 Blades with a blunted edge: 2, 5, 6, 12. Pointes à cran (shouldered points), rock crystal pieces, and jewellery, including Dentalium shells, long tubes often threaded as part of a necklace. 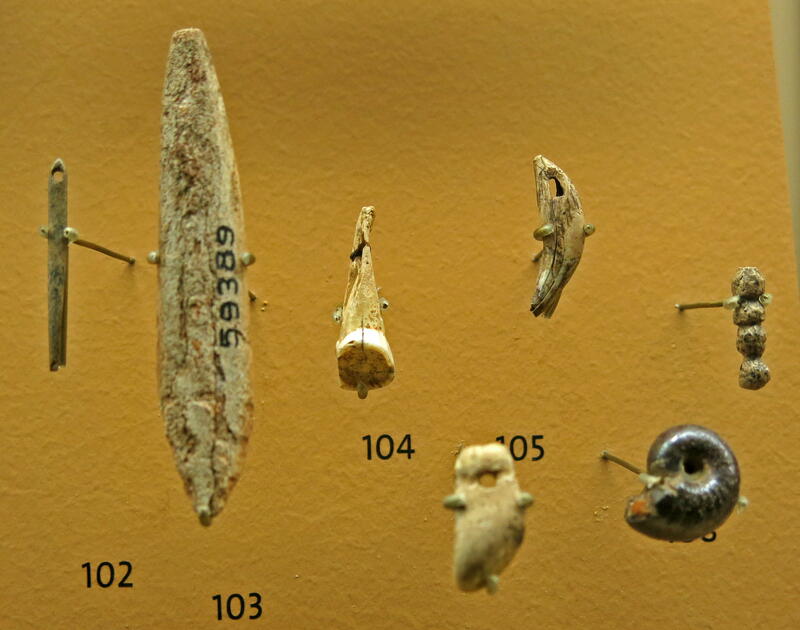 These Dentalium shells were available both from fossil sites and as shells washed up on beaches. 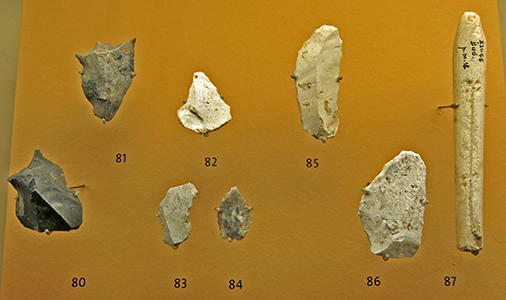 This selection is dominated by the superb scraper on the left, made on a well crafted blade with great skill, and able to be used on all four sides. 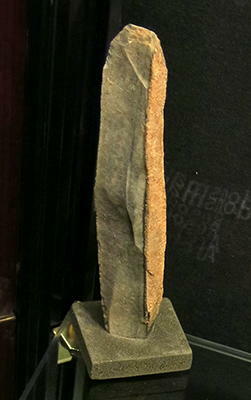 The other pieces are nondescript scrapers and a laurel leaf blade. Various burins : 1, 2, 3, 5, 8, 9, 11. 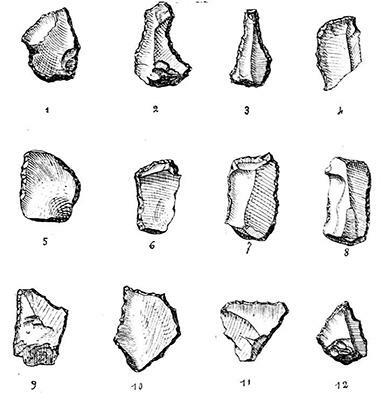 End scraper : 4, 6, 7, 10, 12, 13, 15. 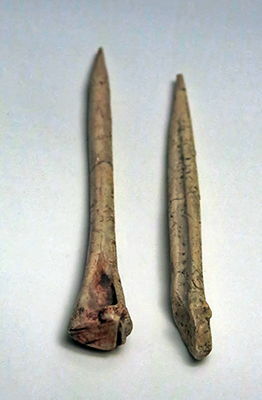 Badegoulian bone awls, from Les Jean-Blancs, Bayac. Cheynier A., 1930: Un outil magdalénien nouveau, en silex à Badegoule - La Raclette, Bulletin de la Société préhistorique de France,1930, tome 27, N. 10. pp. 483-488. Cheynier A., 1939: Le Magdalénien Primitif de Badegoule. Niveaux à Raclettes, Bulletin de la Société préhistorique de France,1939, tome 36, N. 9. pp. 354-396.